There are eight wise owls for children to meet, and lots of new textures to touch and feel in this colourful board book. From tufty tummies to fuzzy wings and fluffy babies, young children will love to explore the touchy-feely patches on every page as they search for their owl. Specially designed to help develop sensory and language awareness in babies and toddlers. A joy to share together – don’t forget to spot the little white mouse on every page! We really enjoyed reading this book, it is, as always with this series, great for my sons sensory development and he enjoys seeing what is on the next page. Our favourite was the baby owls! My son loves the little mouse hiding on each page. Each page is very tactile. There is a tufty owl, an owl with rough wings and an owl with fuzzy wings to name but a few. A real favourite in this house. My little granddaughter really enjoys this book. The pictures are so bright and clear and there are 'feely' bits on every page which she absolutely loves! The language is repetitive yet also introducing new words such as beak and wing. There are eight wise owls for the children to meet in this board book... will help all toddlers in their development of both sensory and language awareness. A delightful series of tactile board books aimed at very young children. The bright pictures, with their patches of different textures, are designed to develop sensory and language awareness. 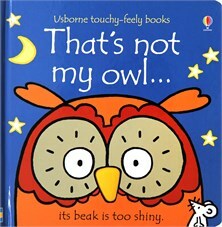 A brilliant touchy feely book with lots of different textures.